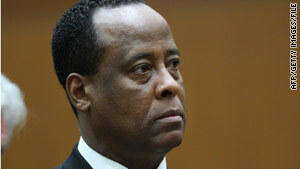 Dr. Conrad Murray is charged with involuntary manslaughter in Michael Jackson's death. Los Angeles, California (CNN) -- A Los Angeles, California, judge refused Monday to ban Dr. Conrad Murray, charged with involuntary manslaughter in Michael Jackson's death, from practicing medicine in the state. The California medical board had asked the judge to add the prohibition to bail conditions for Murray, who was the pop star's personal physician when he died. Michael Jackson's parents, Joe and Katherine, sat next to each other on the front row in the small courtroom, along with the pop icon's brothers Jermaine and Randy and sister LaToya Jackson. "Dr. Murray's the fall guy," Jermaine Jackson said after the hearing. "This is bulls**t."
Several members of the Jackson family have said they suspect that Michael Jackson's death was the result of a murder conspiracy, although they've not made public any evidence. A lawyer for Joe Jackson has said he was preparing a civil wrongful-death lawsuit in the singer's death. Judge Michael Pastor set August 23 as the date for the start of the preliminary hearing for Murray, which the prosecutor said could last a week. Murray's defense lawyers argued that the state was "forum shopping" by asking Pastor to reverse the decision by the first judge in the case not to suspend Murray's license. Pastor agreed. "I simply don't have the ability to revisit the actions of one of my colleagues," he said. Murray is still restricted from using anesthesia with patients, a bail provision he did not object to at his initial hearing in February. The medical board can still initiate its own process to suspend Murray's California medical license, something state Attorney General Jerry Brown has indicated would be done. Murray has not practiced medicine in the state since his last patient, Michael Jackson, died June 25, 2009, of what the coroner ruled was the result of acute propofol intoxication. Propofol is an anesthetic. He resumed his medical practices in Houston, Texas, and Las Vegas, Nevada, last fall, defense lawyer Ed Chernoff said. Suspending his California license would trigger a domino effect, causing Texas and Nevada officials to take action, he said. Taking away his income as a doctor would be a "death nail" in Murray's defense, because he then could not afford to pay for his lawyers or expert witnesses, a spokeswoman for the defense team said.